best thing to try is get a live feed from the battery/starter and unplug the solenoids on the linkage valve, touch the feed on and see if it will lift or lower. I'd change the lift/lower switch on the console first, not the whole panel just the switch, relatively cheap and easy. Our 3075 has nearly 9000hrs and is on its third switch. Other thing is check max lift height dial, ours goes to constant pump when turned to max height, if on say, fert spreader, once arms at top, other services slow down because of this. It never used to do this, must need adjusting. Thinking about it, is the up light on on the console? If so, disconnect the external green buttons on the mudguard, they can give trouble in orrible wet weather. I've no idea. The rams are obviously single acting. 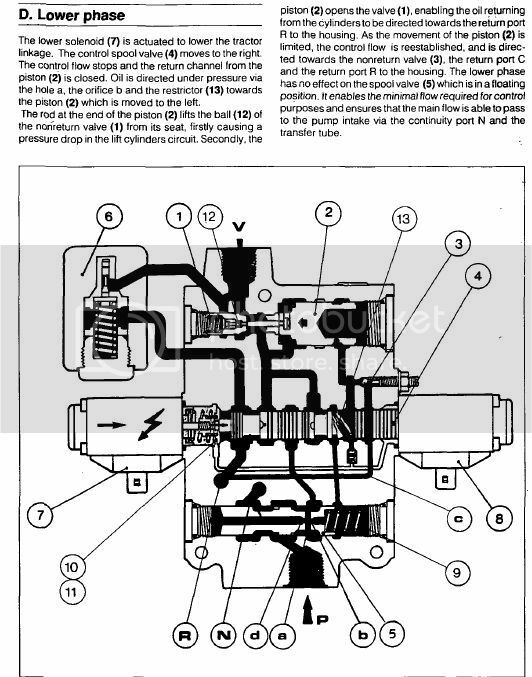 The control valve, where the solenoids are, must divert oil to the rams when activated one way, allow oil to flow through when not, and allow oil trapped in the rams to be dumped back to the sump when activated the other way and therefore lower the links. It is pretty well as simple as that. Perhaps you were not pressing the right way or hard enough on the solenoid ends? perhaps not, anyway im not to concerned about it. most likely needs the extra v to operate the solenoid properly. anyway sorry to clutter up someone else's thread. daft think is when i got to pull the manito out i tryed driveing it and it came out with a proper driver on it so tractor wasnt needed . next move i think is the lift lower valves off the left hand side and see whats in there. maybe a broken or stuck spring? thats if its something i can get into to play with? 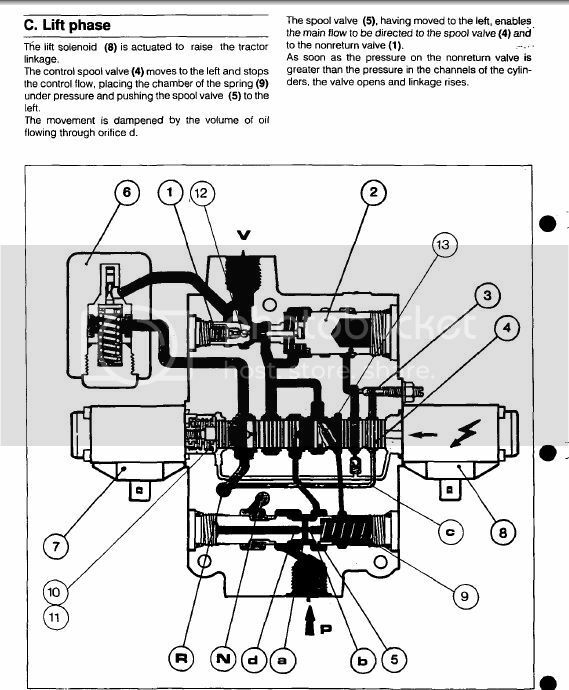 Don't suppose the lift solenoid is stuck in the operating position? Maybe that's not possible though? swap them end for end. this can be done with the lift valve still on the tractor. On my 5455 the D+ engine running signal on my alternator sometimes works, sometimes not, before I knew you could just jumper it I was under the tractor a lot pushing the lower and raise nubs. I'm quite sure it would lower with the tractor off, you have to push really hard though. with a hammer and a drift give all the cap strews a belting on the end. use a good allen key socket and they should undo. ill know where to look when it happens to mine now! but hoppfully by spring will have a shed it will mostly fit under so some jobs can be done on rainy days. Hi cooper, here is info on how the rear lift spool works. Might help. If there was pressure then surely there must be a problem inside the spool block itself????? 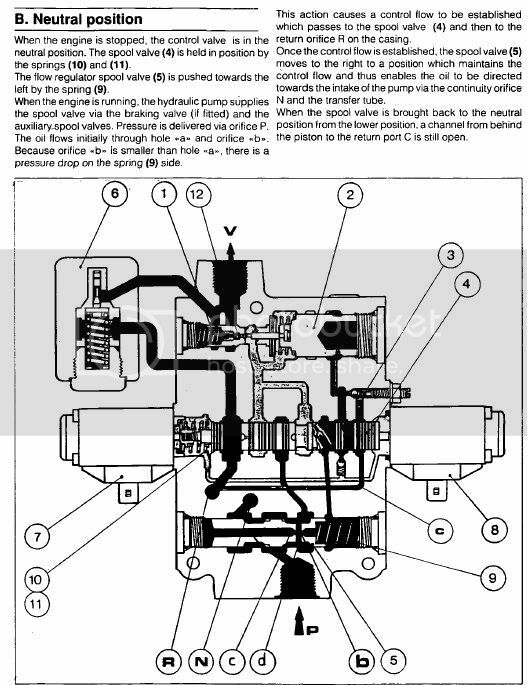 There is a no return valve to maintain pressure in the cylinders, i know very little about these things but this caught my attention???? 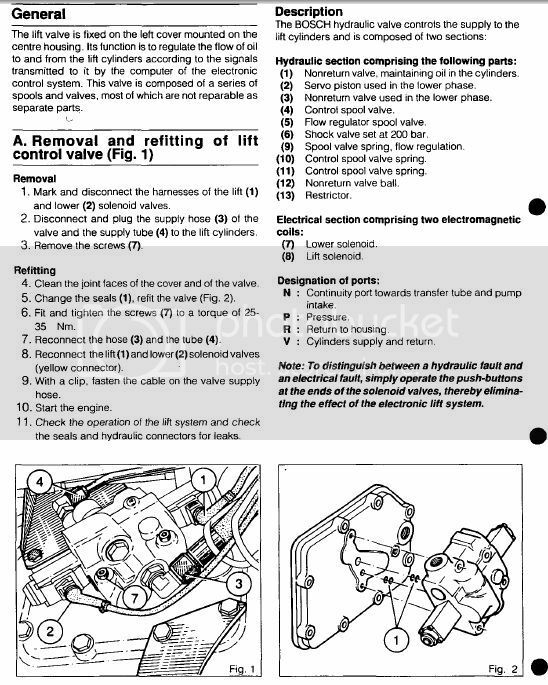 I don't suppose you have the same diagram for the later type lift valve? like late 3120 perhaps on th61s? i had lost the middle rod out (well it had moved internally and i could not see it, i had convinced myself this newer valve didnt have 1 as i just could not find it. last washout of valve and it moved and i saw it, a while prodding and pokeing got the tiny thing out in the end then cleaned and refitted everything. all working as it should now.